The National Water Commission estimates that groundwater makes up about 17 percent of Australia’s currently accessible water resources. It’s estimated that groundwater could be responsible for up to 30 per cent of our water consumption in particular regions, particularly in arid zones throughout Australia, where many outback and remote pastoral properties rely heavily on it as their main water supply. It’s a valuable resource in the face of increasing climate change and dwindling water supplies: but as it stands, accessing and managing groundwater is both poorly understood, and sometimes poorly managed, under the various and inconsistent management policies. Groundwater supplies are being accessed more and more frequently to supplement surface water supplies, and although it represents a brave new world of possibility, it is also in dire need of more consistent management to reduce the impacts on water quality and natural ecosystems. Queensland has been at the forefront of many new groundwater projects over the last few years, including CSG water repurposing, which has already benefited many rural and farming communities with better access to water, and improvements in their struggling yields under Australia’s climate change. While not without controversy—due to the lack of consistent environmental management standards globally, that has contributed to over-extraction and pollution—the use of groundwater for both domestic use and irrigation has already assisted millions farming communities out of poverty. Access to water for irrigation in increasing climate change pressure could also be helped by groundwater storage solutions: engineering will likely become important in the future for its potential to improve the performance of groundwater aquifers and increase their storage capacity, making water supplies more accessible and more resilient during drought periods, particularly benefiting small farmers. Co-management strategies could also be an answer to better water supply sustainability in Queensland, and might be less difficult to achieve, with mixed-use systems: for example, farmers might benefit from using groundwater for summer irrigation, and using the winter runoff to recharge aquifers before the next season. In Australia, many communities benefit from the use of groundwater. But as a finite natural resource, there are a number of threats to its sustainability—and one of the most significant among them is how poorly it’s understood. The vast differences between individual aquifiers, and the diverse hydrogeology of the Australian landscape make it difficult to understand the complexities of groundwater in general terms. While researchers are aware of the issues of overuse, salinisation, resource depletion, and contamination and pollution, understanding how to manage these risks is difficult territory. Poor management of groundwater also proposes a huge problem, including overallocation where unsustainable extraction could result in serious and irreversible long-term degradation to the resource, as well as economic damage to industries and communities that rely on groundwater as their primary water source. While monitoring groundwater aquifiers properly, consistent quality testing, and using appropriately skilled drillers to construct and manage bores can reduce the risk of many of these issues, the increasing demand for groundwater—across both urgent drought situations, and environmental sustainability concerns—is also applying pressure to groundwater access and management practice across the country. Without a doubt, climate change will continue to add to the pressure for groundwater use, as increasingly unpredictable rainfall becomes a more and more unreliable resource. With this pressure comes the need for coherent, consistent and responsible strategies for recharging aquifiers and managing groundwater supplies and waste management, which is likely to include a combination of direct surface and subsurface methods, involving the integration of seepage, infiltration, and injection into aquifiers. Government bodies and independent commissions for groundwater, including the National Water Initiative, are tackling action plans for groundwater knowledge gaps and practice reforms, including improving the skills and practice of both groundwater managers and users, improving general knowledge about the resource, and determining the most sustainable extraction methods for both surface and groundwater systems. Policymakers, environmental scientists and water management professionals in Australia have a tough task ahead of them if groundwater access management is to be consistent across the country in the future. It will involve innovating integrated solutions to the currently exclusive domains of surface water and groundwater, and uniting the opposing proponents of each method among economic and political conflict—as well as negotiating the individual management arrangements of each state and territory. A difficult task, no doubt, but a necessary one if Australia, and Queensland in particular, are to experience the financial and environmental benefits of a more stable water supply. In Australia, bores and wells are most often used to access groundwater, which can be sunk to varying depths depending on the aquifier, geological composition, and the preferred water yield. Bore construction and management is complex, and it requires extensive experience and training, and deep industry knowledge of best practice for environmental management. It can also be extremely hazardous: it should always be carried out to approved standards, by professional drillers, who meet government and water authority licence conditions and their guidelines for operation and maintenance. 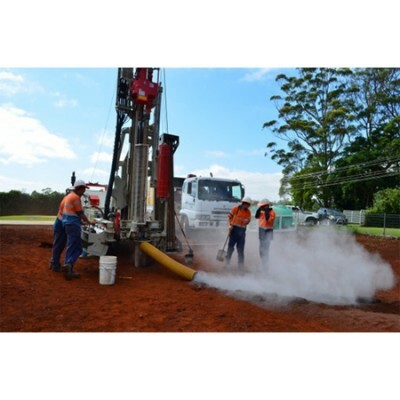 Drillpower QLD rely on a team of fully trained professional drillers with broad experience in drilling domestic water bores. Whether it’s shallow monitoring, or larger scale wells for environmental monitoring, we can accommodate your specifications, and we practice according to legislation and best practice. Contact us anytime for advice or a quote for drilling water bores on your property, and we’ll deliver the highest standards of technical expertise, safety, and environmental sustainability possible, to help you benefit from the natural resources of your land.